The weight of retirement can often be overwhelming. Beyond the financial aspects of retiring, the physicians we have spoken with often mention a fear associated with retiring, especially when considering retiring early. Fear of boredom, regret, or the threat of being wrong about how much you need to retire can hang like a dark cloud over physicians’ retirement decisions. There are, of course, many personal decisions to make with your family. Finding that sweet spot on the “likelihood of regret scale” (see table 1), and discovering meaningful activities and projects to fulfill your life after retirement is a personal journey best consulted with loved ones. However, for those physicians considering early retirement, having a trusted financial planner on your side can not only serve as a sounding board for your plans but can also help arm you with the necessary information to make the appropriate financial decisions for your retirement goals. First things first– we believe it is important that you make sure you understand the difference between “retirement” and “financial independence”. Financial independence is a goal we should strive for no matter where we are in our career path. Financial independence can help reduce the financial anxiety of the retirement decision. Once financially independent, you are able to dictate the terms of your employment and create time in your schedule to focus on your passions, whatever they may be, rather than working according to some employer’s agenda just to produce income. The idea is to become financially independent when retired, however, physicians are some of the few careers which can potentially have the opportunity to reach financial independence early on in their careers. This leaves the option to continue working, exploring other passions or doing a combination of both. How long does it take for one to become financially independent? That all depends. For some, it can be achieved in less than 30 years of labor. Some could achieve financial independence in as little as 10 years if one is thoughtful and dedicated. (Physician on FIRE, 2018) We believe it is important though to consider the following three steps to achieving financial independence in order to retire early. Step 1. Become completely aware of your yearly spending. In order to understand how much money you will need each year to maintain the lifestyle you want, you must consider what you are spending now. Working with a financial advisor can help gather and analyze your data, along with personal spending habits, and future lifestyle goals in order to lay out your current yearly picture. We suggest not including your mortgage in this figure, as this will be more important in step three. Step 2. Determine how much you will need to retire. Once you’ve figured out what you would need annually to comfortably enjoy the lifestyle you want, multiply that figure by 25. This number should last you 25 years – potentially more if you are taking investing/investments into consideration. Again, a financial advisor here can help you think through all the scenarios and life events to determine a reasonable number to aim for. Step 3. Aggressively save the rest. Now that you know what you are spending annually you can have more control over what you are spending and saving. Are there opportunities to cut spending? Is your home interfering with your retirement goals? Are you optimizing your retirement plans as well as saving elsewhere? It is important to not only maximize work or other retirement plans but also strategically save elsewhere to reach your goals. 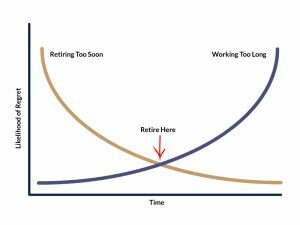 Please understand, we are not suggesting early retirement is as easy as 1-2-3. Though these are our recommended first steps to planning for retirement, whether early or not. If you would like more information on early retirement for physicians or discuss your current plan, let us know! The opinions expressed herein are those of Morris Financial Concepts, Inc. and are subject to change without notice. This material is for informational purposes only and should not be considered investment advice. Morris Financial Concepts, Inc. is an independent investment adviser registered under the Investment Advisers Act of 1940, as amended. Registration does not imply a certain level of skill or training. More information about Morris Financial including our investment strategies, fees and objectives can be found in our ADV Part 2, which is available upon request. MFC-18-13.